Researched and contributed by Marc McInnes from the original magazine. The large gathering of citizens that were assembled on the morning of November 22nd in the immediate vicinity of his late residence, for the purpose of paying their last sad respects to all that was mortal of Dr. May, were greatly surprised and astonished at the rapid approach of a car enveloped in a cloud of dust, and which apparently was being driven with an utter disregard of the condition of solemnity which reigns on such mournful occasions. 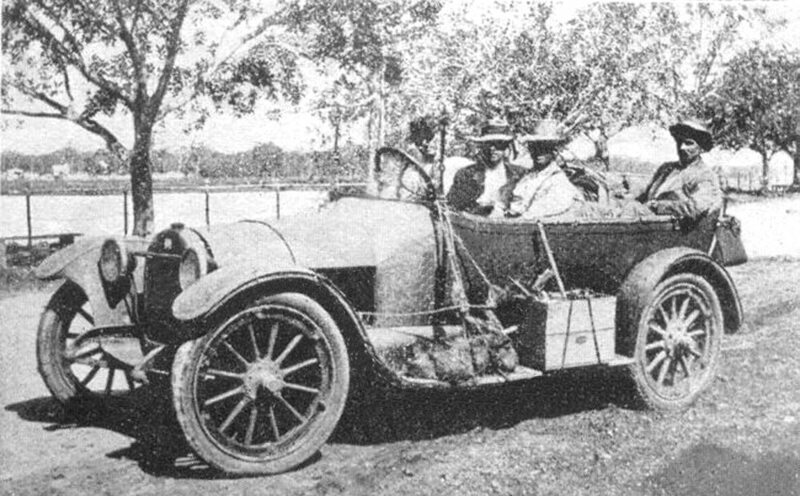 However, as thecar stripped of wind screen and hood, and showing evidence of a long trip-raced between the long line of vehicles, it was quickly recognised that the passengers were Mr. Kenneth (“Peter”) May and his wife, who had just reached here by-road from Rockhampton, in time to see the last mortal remains of a loving father. Speaking subsequently to Messrs William and Frank Finlay, of Finlay Bros., motor car proprietors of Rockhampton, and formerly well known and respected members of the local cab rank, in one of whose cars it was that the trip was made, a re- presentative of the “DAILY NEWS” (Bundaberg) elicited the following account of the strenuous overland journey, which they had just so successfully and expeditiously completed. A start was made from Rockhampton the previous afternoon at 3.30 P-M, the run through to Gladstone, a distance of 96 miles. taking three and a half hours. After par-taking of tea and a brief rest at the harbour town, the run was continued at nine o’clock and within an hour the Boyne River was reached, and here the state of the tide seemed to effectually challenge the progress of the motorists. However, this, the first difficulty was easily negotiated with the kindly assistance of the well-known fisherman, Mr. Christie Conneil, who, offered his services as a pilot. Continuing Bororen was left behind at 11.3.o and Mirlarn Vale passed through at midnight. The gates of Thornhill Station were. reached an hour later, a halt was made, owing to the precarious state of the roads, and creeks in that locality. However, daylight saw the car again in motion, and by 7:30 Rosedale hove into sight. The next stage, as far as Mullett Creek – which is practically an unused road – was very bad owing to the amount of fallen timber, long grass which, in places completely obliterated all trace of the track – and numerous washes-out, eight miles per hour being the best that even expert driving could manage. Later, the road improved, and an average of twenty miles was maintained through to Yandaran. Entering upon the final stage, and with only forty minutes to reach their destination- Bundaberg – The Yardaran Hotel was left behind at ten minutes to ten; the run through Invicta to the Kolan – Smith’s crossing – occupying twenty minutes, and with a speed which ran at times up to fifty miles per hour over the remaining few miles of the 26o mile journey, Mr and Mrs. May reached their tragic destination at 10:29, or one minute short of the hour fixed for the funeral to move toward the cemetery. Throughout the long trip no car troubles what- ever were experienced, ‘not even a puncture which speaks volumes for the reliability and splendid running qualities of the six-cylinder ‘BUICK..’ This particular car, we may, mention, is one which if it has not established a mileage record, must be very close to one, for although only on the roads seven weeks, it has already travelled over five thousand miles. In this connection it may be said as evidence of the scope of this connection which Messrs. Finlay Bros, enjoy in Rockhampton, that their cars are generally in demand for long service runs, some of the trips which they have negotiated extending from Rockhampton to Townsville.The two brothers who made the trip we have described, after spending a couple of days in Bundaberg renewing acquaintanceship of old friends, returned by road to Rockhampton in the”BUICK SIX,” the return trip being negotiated without the slightest trouble of any kind. Immediately the car returned, it was washed down and then started off on another trip to St. Lawrence, a distance of over 100 miles North of Rockhampton.